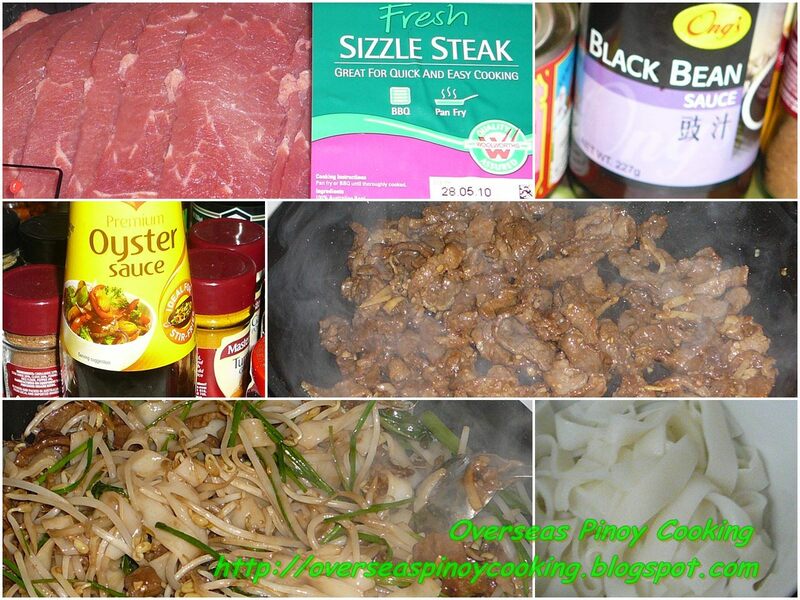 Beef Chow Fun is another Chinese style stir fried flat rice noodles. Again this dish is not only delicious it is also quick and easy to prepare. I recommend fresh beef tenderloin or strip loin for this recipe, beef should not be overcooked to maintained the tenderness of fresh beef. The fresh or dried (if using) rice noodles should also be cooked as per package directions and never over cooked, remember that it is again stir fried when mixed with the other ingredients. The vegetables should also be crisp especially the bean sprouts. here is the recipes. Put the beef strips in a big bowl, add in the soy sauce and cornstarch mix thoroughly let marinate for at least 10 to 15 minutes. Heat wok at high heat until it start to smoke, pour 3-4 tablespoon cooking oil, stir in garlic, ginger and onion until fragrant, remove from wok and keep aside. In same wok and using the same oil stir fry beef in batches 2 to 3 minutes or until beef are seared, remove from wok and keep aside. In same wok stir fry choy sum for a minute, return the garlic, ginger, onion and beef to the wok, add in the black bean sauce and oyster sauce, stir cook for another 2-3 minutes. Mixed in the noodles and add the chives and bean sprouts, quick stir cook for about half a minute, correct seasoning if required. Remove from wok and serve immediately.